We’re SO thrilled to announce that we have been shortlisted for the Non-Serviced Accommodation (Self-Catering) of the year award in the upcoming 2017 Northern Ireland Tourism Awards!! A big thank you to all our guests who have stayed with us over the years & to all our future guests & of course our amazing team! 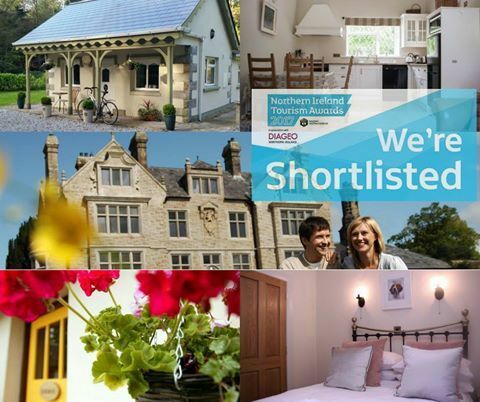 Our collection of 5 award winning self-catering apartments are ideal for family breaks, romantic breaks and groups. Guests can enjoy a relaxing country estate experience. Guests can choose from 1 bedroom or 2 bedroom self-catering accommodation, all of which are pet friendly. Experience a home from home environment with the apartment’s warm and inviting décor. All apartments feature open plan Living, Dining and Kitchen areas. On site laundry facilities are available. As a family estate guests enjoy a warm welcome from Estate Owners Colleen and Nicholas Lowry. Enjoy a complimentary welcome basket filled with homemade wheaten bread, jam and shortbread.